Super-natural sound reproduction with extended bass response makes the eH 1430 a true all-rounder. Fitted with neodymium magnets for a wide dynamic range, this open design offers reduced weight for comfortable, extended wear even during the longest monitoring sessions. Rugged construction for a dependable lifetime of high quality monitoring. 3m OFC copper signal cable ensures ample freedom of movement. 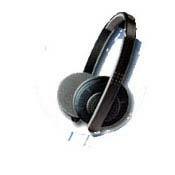 - Open design dynamic stereo headphones. - Natural sound reproduction with extended low frequency response. - Neodymium transducer magnets for high dynamic range. - Light weight, comfort fit. - 3 m cable with OFC copper conductor. I have used the set for about 13 years, and during such a long period I have also tested various other brands and models. I find the Sennheiser eH 1430 well balanced as regards the frequency spectrum; certainly this may be adjusted for a particular program by using an equalizer, which I definitely prefer to an preset bass boost set. These headphones provide excelent sound quality, are extremely comfortable to use, induce an excellent surround feeling, and last long. At present, I have been comparing eH 1430 with the state of the art Sennheiser Momentum (brown) just bought by my son. I think the old set has a better mid and high range freq. domain reproduction and to match the low freq. domain they just need a 3 db bass boost adjustment. However, the difference in price is from 35 EUR to 239 EUR, old and new, respectively. So, one may judge. I got these years ago as a cheap set of 'phones for dorm use. They're actually very average. They are dark and not very efficient. I have several other Sennies and this one was a big disappointment. The foam lasted a long time and I found this site doing a websearch for replacement foam. I wouldn't recommend this set if it is still made. Life is too short for crappy gear. This is just bland and dark and very unlike the better Sennies. Avoid these headphones. They're comfortable to wear but sound awful. The sound is aggressive and unpleasant with harsh and tinny treble and hardly any bass at all. Turn up the volume and the sound gets even worse. Maybe this is typical of headphones in this price range, but the slightly more expensive Senn PX100 sound a lot better (but by no means excellent). I have been using this headphone for my guitarcombo, so the neighbours wouldn't be disturbed, and I must say that when I put in my output from my effectpedal the sound is better then when it goes through my combo. I love this thing, the cord is very long so I can jump through my (tiny) room while playing:).